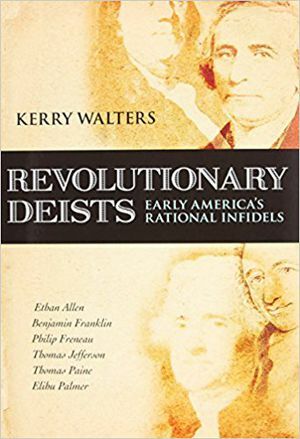 Difference between revisions of "Revolutionary Deists: Early America's Rational Infidels by Kerry Walter"
Kerry Walter’s book Revolutionary Deists: Early America's Rational Infidels published by Prometheus Books focuses upon the period from 1725 to 1810 and the influence of deism on American society and its religious life. The main argument of the book is that deism played a leading role in America life and influenced some of the leading figures in American life at this time and left a lasting impression on the young nation. Deism is the belief that the human mind can employ reason to comprehend truths in the world. Desists emphasize reason in all aspects of life including religion and they appealed for a rational approach to religion. Deists believed ‘reality is the creation of a perfectly benevolent and rational deity’ God for many Deist was the ‘Supreme Architect’ who created the world, so that it ‘conforms to universal and immutable laws’. The human mind can comprehend these laws and ‘therefore come to gain a deeper appreciation of the Divine Architect’. held that reason was the only way to know God and his ways. They tended to deplore as superstition any religious doctrines that were not based upon reason. Superstition was holding people back and preventing progress. The Deists rejected many traditional doctrines such as the Trinity and the Divinity of Jesus. Deists also condemned Christian ethics. The majority of Deists were hostile to Christianity as they viewed it as an ‘obstacle’ to human progress. Walters describes Deism as a movement that was implicitly revolutionary in that it sought to make radical political, religious and social change as reason was to transform every aspect of American life. Yet as Walters makes clear this was a movement that was defeated and orthodox Christianity was ultimately triumphant. Walters seeks to illustrate the nature of American Deism through the lives and thought of some prominent American Deists (Walters, 11). They were very influential in establishing Deism as a credible intellectual force in America. He describes the life and thought of six key American Deists. These six men were Ethan Allen, Benjamin Franklin, Philip Freneau, Thomas Jefferson, Thomas Paine and Elihu Palmer. Walters uses these men to illustrate not only the nature of Deism, but also its evolution, influence and the variety of opinions within the movement. Walters believes that Deism initially was a quietly subversive movement- quietly gaining influence and undermining the authority of Orthodox Christianity. In later years it became an overtly revolutionary movement, during and after the American Revolution when deists urged a radical restructuring of the young Republic’s society and values. The Deists were also interested in social reform. They believed that reason and its application to society was essential for the happiness and progress of humanity. Reason was to be the guide to all social institutions. The American Deists, as a result were very interested in social reform. They were among the first to call for the abolition of slavery. Jefferson, for example as President prohibited the importation of slaves into America. Walters investigates Deism through the lives, thoughts and public life of six prominent Deists. The author makes clear that all the Deists despite some differences were basically united on the fundamentals of Deism. He begins with Benjamin Franklin he was extremely sympathetic to rationalism and Deism. Franklin was typical of the early Deists reluctant to publicize their beliefs as they feared being stigmatized and who also still retain a lot of respect for Christianity. Franklyn is shown as a conflicted character, who wanted to marry Deism and Calvinism. American Deism began to change, just prior to the American Revolutionary period, but only slowly. Ethan Allen was prominent in the America Revolutionary War. In the early years of the American Republic he wrote a book Reason: Man’s only Oracle. This was a failure in terms of sales but it did attract a lot of attention. In this work Allen attacked the Bible, the Priesthood and the clergy. 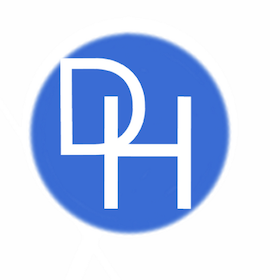 With Allen we see American Deism becoming increasingly public and a revolutionary movement. Thomas Paine was perhaps the first strident Deist, he actively and publically criticized the institutions and beliefs of Christianity in America. He publically identified himself as a Deist. He also criticized the Bible and all ‘revealed religion’. He deplored revealed religion as mere superstition and that they were obstacles to the emergence of a genuinely rational reason. Elihu Palmer was a friend of Paine and a blind Presbyterian Minister. He actively championed Deism and he declared that it was time to be bold and promote Deism in order to change the world. In several works he championed Deism as ultimately moral and which could deliver humanity from superstition, the source of human misery and unhappiness. Thomas Jefferson was sympathetic to Deism but he was also sympathetic to Christianity as a moral system. He wrote works that tried to offer a rational Christianity, unlike some Deists he recognized the Bible as a valuable document because of its ethical teachings. Walters believes that his Deism was crucial in Jefferson’s policy when it came to the separation of Church and State. However, it could also be argued that Jefferson was as much an unorthodox Christian as a Deist. After Jefferson Walters studies the poet Philip Freneau, whose poetry did much to popularize the ideas of Deism. His Deism was much influenced by Romanticism and perhaps it could have been better to have classed him as a Romantic. The opinions of the Deists despite sharing the same basic beliefs was often very different. This was especially the case with ethics. The American Deists were often divided on the issue of ethics, especially Christian ethics. Franklin and Jefferson were sympathetic to aspects of Christian ethics and believed that it was compatible with Deism. On the other hand there were those Deists who wished to discard Christian ethics, and saw it as an obstacle to human progress and happiness. Thomas Paine wanted a complete break with Christian Ethics, while Elihu Palmer presented a biologically based ethics. There was also differences among the American Deists with regard to Christianity, some were sympathetic to some aspects of its, especially if it was shorn of its superstitious aspects while others such as Paine were implacably opposed to Christianity. The high point of Deist influence in America was in the late eighteenth century but it went into rapid decline soon after. The decline of Deism in America after nearly a century of high regard in intellectual circles was remarkable. After approximately 1810 "the philosophical, theological, and methodological presuppositions upon which deism built its case” were undermined. Deism offered a mechanistic and deterministic universe and people turned against such a view. Gradually American Deism lost its intellectual authority according to Walters as many began to see its reliance upon a rationalist worldview as too simplistic. According to Walters ‘’In broad terms, the reason for this breakdown was that the deistic worldview, founded squarely upon the New Learning's allegiance to mechanism and rationalism, began to be perceived as too simplistic, and hence a distortion of reality." David Hume’s criticism of reason raised doubts as to whether it could be reliable and if humans were rational creatures. The rise of Transcendentalism was another blow to Deism. Influenced by Romanticism, it suggested that there were unfathomable aspects of the human experience and emphasized intuition over reason. Ironically the Deists success in ’ameliorating the dogmatic supernaturalism of Orthodox Christianity in America’ meant that their arguments were not as pertinent to American religious life. Walters finally discusses the legacy of the Deists. They had an impact on religious life in America and ensured that the various Orthodox Christian groups did not emphasize the supernatural aspect of Christianity. Their influence was also particularly in the area of social reform. They were early champions of the abolition of slavery and women’s rights. The American tradition of and commitment to social reform is perhaps their greatest legacy.